There are five best coffee tables and end tables for your picking up. They are designed for any space décor. Are you looking for a beautiful and suitable end table for your living room? If you are, you should spend a minutes in the follow products. We select five best coffee table and end tables from the top50 list. I think you will find a good one! 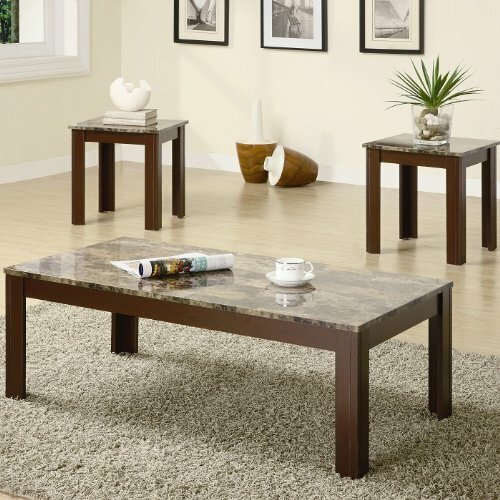 The Coaster 700395 3-piece Coffee table and End table set with faux marble top in brown finish. 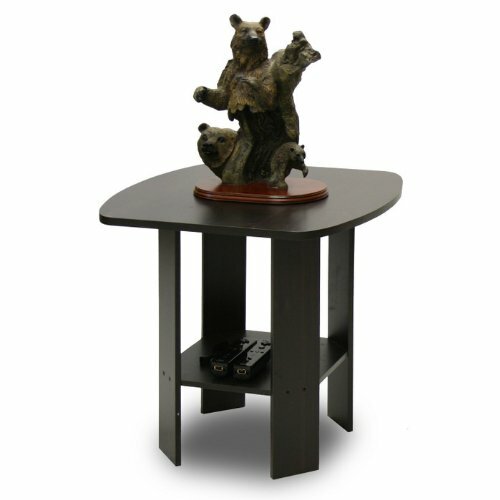 It features a brown finish on the legs and a grey marble-like table top. You can place this end table near a sofa or recliner for style and functionality. The table is versatile with any décor. In addition, the product dimensions are 44*22*15 inches and the item weights 54 pounds. 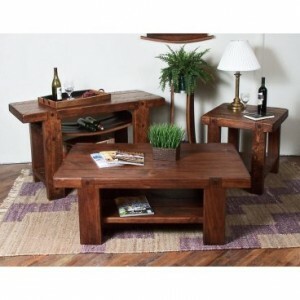 The casual 3-piece occasional table set features solid wood and veneers. It is a perfect for any living space and will surely provide you with more than enough storage space for magazines, books, and remote controls. In addition, the coffee table measures 40*20*16 inches and the end tables measure 18*18*18 inches. 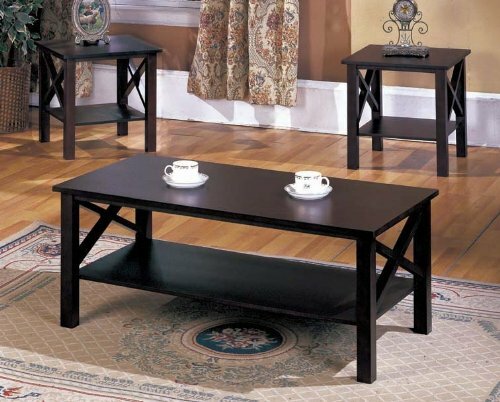 This Black Forest Coffee Table has a stylish contemporary design to compliment any décor in the home. It is finished in attractive black forest. The table can support a maximum of 100 pounds on top shelf, supporting 100 pounds on middle shelf, supporting 50 pounds on each side of bottom shelf. It’s easy to assemble with household tools. 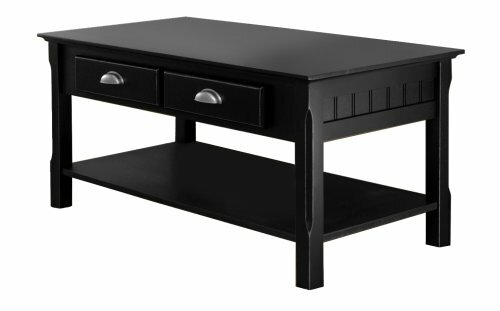 The simple and straight-forward design of this Furinno end table/night stand makes an easy matching piece to any room. 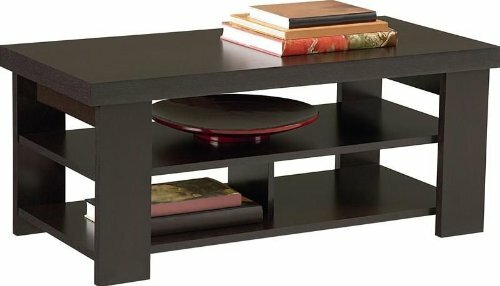 The end table provides a lower shelf for storing remote controls, accessories and more. The materials comply with e1 grade particle board for furniture. There is no foul smell of chemicals, durable and it is the most stable particleboard used to make furniture. This coffee table makes a distinctive solo statement or adds the finishing touch to Winsome Wood’s matching hall and end tables. The roomy tabletop features a bevel-edged rectangular shape with a wide apron that hosts two storage drawers and plank-inspired panels. Below, the chunky rectangular legs are carved on the outside corner for airy elegance, and the open shelf displays collectibles, showcase large books, or holds sea grass baskets. 5 Best Oval Glass Coffee Tables – Pretty good!